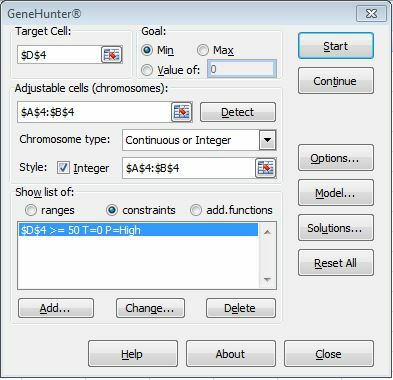 The GeneHunter Dialog Screen enables you to identify the cells in your spreadsheet that are involved in solving your problem. You also specify a problem solving method and list hard and soft constraints that influence the solution. The Start button on the GeneHunter dialog box enables GeneHunter to begin evolution of your problem. The Continue button allows you to resume evolution of your problem from the point at which you stopped the last time. Once you have begun evolution of your problem, you may stop it by pressing the Ctrl (Control) and Break keys. (You may also press the Escape (Esc) button on your keyboard, but it may not be as effective as pressing the Ctrl and Break keys. In some cases, you may have to press the Esc button twice. Do not hold the Escape key down for more than 1 second!) You will know that evolution has stopped when a dialog box appears informing you that your request has been accepted, and to wait until the end of the current generation.